Marenus Andrew Asbjeld was born on 12 June 1886 at South Dakota also reported as Jun 1885. He was the son of Anders P. Asbjeld and Lava O. Jamtgaard. Marenus Andrew Asbjeld married Rena O. Wolden, daughter of Ole Svendsen Wolden and Ingeborg Arntsdatter Solem, circa 1911. [S245] U.S. Federal Census 1900 U.S. Federal Census, by Ancestry.com, Year: 1900; Census Place: Spink, Union, South Dakota; Roll: T623_1555 Page: 8A; Enumeration District: 340..
[S244] U.S. Federal Census 1910 U.S. Federal Census, by Ancestry.com, Year: 1910; Census Place: School District 88, Meade, South Dakota; Roll: T624_1485; Page: 2A; Enumeration District: 78; Image: 379. [S243] U.S. Federal Census 1920 U.S. Federal Census, by Ancestry.com, ED243. Dwelling 183. Johanna A. Asbjeld was never married. She was born in November 1886 at South Dakota. She was the daughter of Anders P. Asbjeld and Lava O. Jamtgaard. [S250] U.S. Federal Census 1930 U.S. Federal Census, by Ancestry.com, Year: 1930; Census Place: Sioux Falls, Minnehaha, South Dakota; Roll: 2228; Page: 7B; Enumeration District: 31; Image: 328.0..
Peter A. Asbjeld was never married. He was born in December 1889 at South Dakota. Married Name circa 1911 As of circa 1911,her married name was Asbjeld. Rena O. Wolden was born on 1 December 1885 at also reported as South Dakota, Norway. She was the daughter of Ole Svendsen Wolden and Ingeborg Arntsdatter Solem. Rena O. Wolden married Marenus Andrew Asbjeld, son of Anders P. Asbjeld and Lava O. Jamtgaard, circa 1911. Rena O. Wolden died on 7 January 1976 at Minnesota at age 90. Oliver M. Asbjeld was born on 19 January 1912 at South Dakota. He was the son of Marenus Andrew Asbjeld and Rena O. Wolden. Oliver M. Asbjeld died on 20 May 1923 at age 11. Name Variation Zelock Burdick was also known as Benjamin Thaddis Pealeg. Zelock Burdick was born in 1790 at England. He married Amanda Hodgan circa 1811. Name Variation Amanda Hodgan was also known as Hadgram. Married Name circa 1811 As of circa 1811,her married name was Burdick. Amanda Hodgan married Zelock Burdick circa 1811. Enoch Ikeler married Emily Armenia Curtis. Married Name Her married name was Ikeler. Emily Armenia Curtis married Enoch Ikeler. Name Variation Alda Bump was also known as Alta. Alda Bump was the son of Charles Arthur Bump and Mary Jane Whitten. Alda Bump married Bessie Hehn. Married Name Her married name was Bump. Bessie Hehn married Alda Bump, son of Charles Arthur Bump and Mary Jane Whitten. Name Variation Charles Arthur Bump was also known as Arthur. Charles Arthur Bump married Mary Jane Whitten. Married Name Her married name was Moyer. Mary Jane Whitten married Charles Arthur Bump. Victor Mudica married Leona Elsie Powers. Married Name Her married name was Mudica. Leona Elsie Powers married Victor Mudica. Arnold L. Jamtgaard was born on 4 July 1904 at Iowa. Arnold L. Jamtgaard married Ellen Clara Stene, daughter of Ole O. Stene Jr. and Oline J. Barboe, on 4 September 1927. Arnold L. Jamtgaard died in July 1976. 1905 Sioux City, Woodbury, Iowa Arnold L. Jamtgaard appeared on the census of 1905 in the household of Louis O. Jamtgaard at Sioux City, Woodbury, Iowa; household also includes Anna Ronning. Mervin M. Sage was born on 5 November 1899 at Iowa. He was the son of Harry Sage and Louisa Muck. Mervin M. Sage married Alice Jamtgaard, daughter of Louis O. Jamtgaard and Anna A. Solem, circa 1921. Mervin M. Sage died in September 1975 at Missoula, Montana, at age 75. Robert Mervin Sage was born on 16 May 1926. He was the son of Mervin M. Sage and Alice Jamtgaard. Robert Mervin Sage died on 30 August 1994 at age 68. Harry Sage married Louisa Muck, daughter of (?) Muck, before 1899 at Minnesota. Harry Sage died before 1925. Name Variation Louisa Muck was also known as Sadie. Name Variation Louisa Muck was also known as Mack. Married Name before 1899 As of before 1899,her married name was Sage. Louisa Muck was born in October 1876. She was the daughter of (?) Muck. Louisa Muck married Harry Sage before 1899 at Minnesota. Louisa Muck died before 1925. Louisa Muck had 3 with 3 living in 1910 children. [S245] U.S. Federal Census 1900 U.S. Federal Census, by Ancestry.com, Year: 1900; Census Place: Sioux City, Woodbury, Iowa; Roll: T623_467 Page: 4A; Enumeration District: 172..
Hazel Sage was born circa 1904. She was the daughter of Harry Sage and Louisa Muck. Orville Sage was born circa 1907. Married Name circa 1900 As of circa 1900,her married name was Scott. Emma E. Muck was born in November 1881 at Minnesota. Emma E. Muck married James H. Scott circa 1900. James H. Scott was born in March 1876 at Scotland. He married Emma E. Muck, daughter of (?) Muck, circa 1900. Albert F. Vincent was born circa 1862. He married Ida C. Coats before 1919. Albert F. Vincent died after 1930. Married Name before 1919 As of before 1919,her married name was Vincent. Ida C. Coats was born on 7 April 1884. She married Albert F. Vincent before 1919. Ida C. Coats died on 19 July 1976 at age 92. Name Variation Marietta Shultz was also known as Mettie. Name Variation Marietta Shultz was also known as Maryetta. Married Name 3 March 1867 As of 3 March 1867,her married name was Prouty. Marietta Shultz was born in April 1843 at Conneaut, Ohio. She married John T. Prouty, son of Barnabas Prouty and Rebecca Trumbo, on 3 March 1867 at Sauk, Wisconsin. Marietta Shultz died between 1910 and 1920. Marietta Shultz had zero, but adopted son children. Married Name circa 1892 As of circa 1892,her married name was Sebring. Angela M. Prouty was born in September 1872 at Iowa. She was the daughter of John T. Prouty and Marietta Shultz. Angela M. Prouty married Eugene Sebring circa 1892. 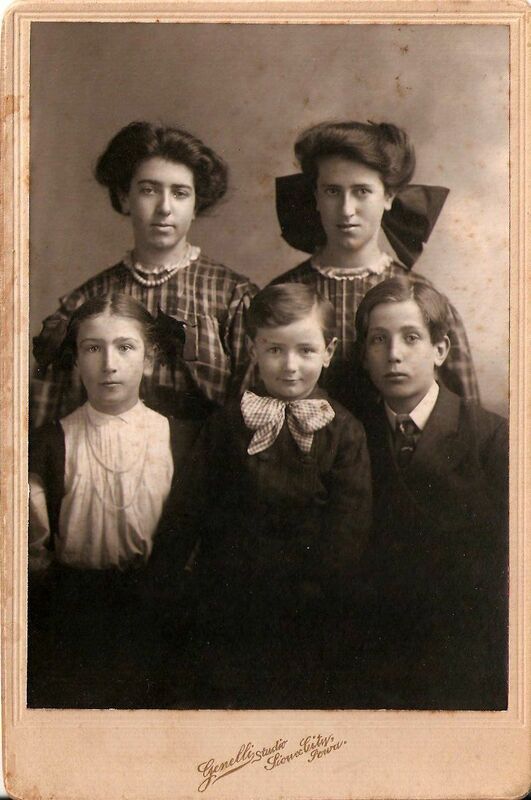 5 with 5 living in 1900. Eugene Sebring was born in February 1859 at Michigan. He married Angela M. Prouty, daughter of John T. Prouty and Marietta Shultz, circa 1892.